We had a picnic once, some years ago. We had the hot dogs, the long forks for roasting the dogs over a fire, the newspaper to use as kindling. We even had the wood.The only thing we didn’t have, because each thought the other had packed it, was the box of matches. We were only partially prepared. Fortunately for us, there were kind people at the park who gave us some matches so we could light our fire. One aspect of this parable is its comparison to the beginning of this Christian age, in which people stood separated from the world, and in great anticipation of the soon return of the Lord Jesus. If we embrace the gospel of grace, then we will also joyfully live a life that reflects the holiness and purity of Christ. It will not be a burden to do so. We will also live in that hope of the imminent return of Jesus. The word virgin contains the same idea of separation. How different, though, their world was from ours. It was a badge of honor to be a virgin in those days in Israel, one who was pure and waiting for her bridegroom. In our sad culture today, kids in high school are mocked for their virginity. So are believers mocked, even by other believers, if they take a strong stand for living a separated and holy life. The lamps tell of another characteristic of believers. We are to be lights in the world. Christians are still called to go forth, away from the sin of the past, and to carry the light of the Word of God to a lost and dying world. 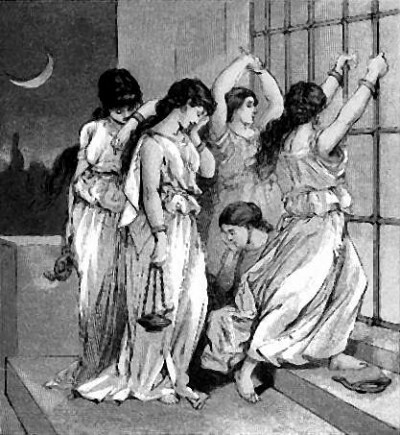 Five of the virgins who professed Christianity were foolish. They were only partially prepared, as my husband and I were only partially prepared for our picnic. They had lamps, but they did not carry oil to replenish their lamps. The lamps were rounded receptacles for pitch or oil. A wick floated on the oil. The receptacle was placed in a larger hollow cup or deep saucer, which was fastened by a pointed end into a long wooden pole so that it could be carried high enough to provide light for the pathway. The foolish virgins didn’t have the fuel. They represent those who only profess Christianity, but do not truly possess it. Their lamps are empty, and they give no light. The fact that they went with the others to meet the bridegroom does not make them true believers. Later, it will become clear that they were not. They are perfect examples of those who have the “form of godliness, but deny the power thereof” (II Tim. 3:5). Reblogged this on God's Word for Women.